The Retreat Center at Sunset Ranch is only 25 minutes south of Fort Worth, but worlds away from the hustle and bustle of city life. We provide the peace and quiet that feeds your creativity, as well as fabulous sunrises and sunsets to inspire you. View a Slide Show of the facility. 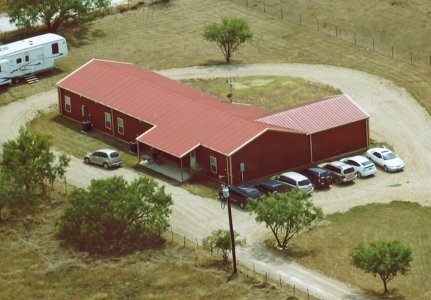 View a Map to the facility. Quilters will love the huge sewing room, which comfortably and spaciously sits 12 people. The room also features bright lighting and plenty of electrical outlets, as well as an internet connection for your computer, if you choose to bring one. 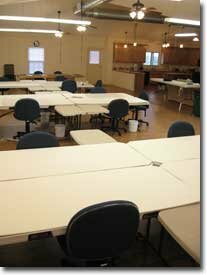 The sewing room is equipped with a large, raised cutting table, along with 2 cutting boards and raised ironing station. Two irons are provided for your convenience. The walls are covered with foam board and batting for wrap around design walls. The "Heavenly Sewing chair" (available for purchase) increases your comfort during long periods of stitching. The retreat center has six bedrooms, with two people to a room and a private bath. All linens are supplied. A tankless water heater system provides constant hot water. One bedroom is ADA compliant. 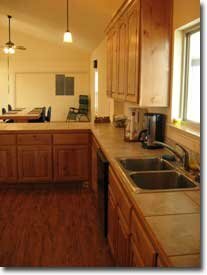 A very large kitchen is equipped with all of the amenities you'll need for cooking your own meals. There is a very comfortable living room with a TV for your relaxation. The price is $420.00 per night plus tax. We can accommodate up to 12. A non-refundable fee of $100.00 is required to hold your reservation, this $100 does not transfer toward the balance due at retreat. If you would like to reserve the same dates for the following year, an additional reservation fee will be collected at check out. We will try to accommodate any special situations you might have.